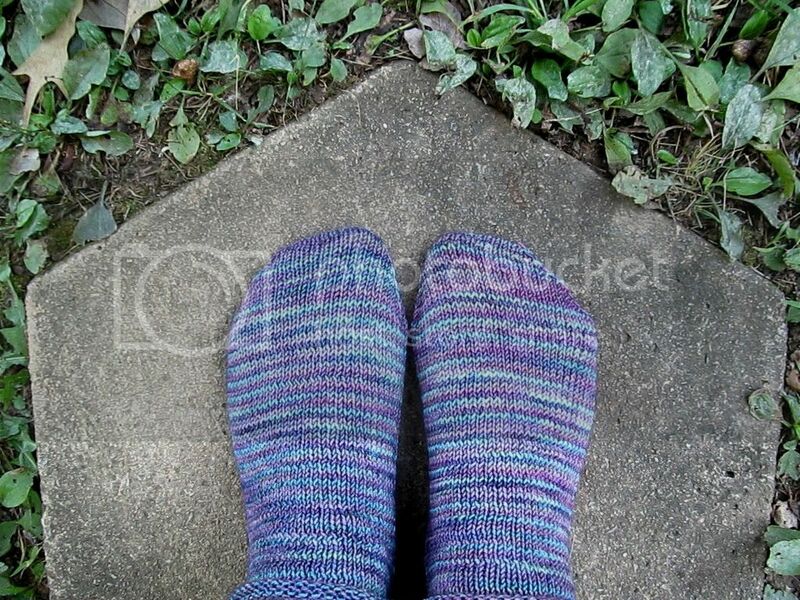 Wool and Wheel: Knitting: summer socks. I've always thought it was a shame that I only wore my knitted socks during the fall and winter. I'm not one of those people who likes going around the house barefoot, so all summer I wear cheap ankle socks that are basically polyester...I don't think they have a bit of cotton in them, and they develop holes really quickly. I just did my usual vanilla socks, except that I only knit for one inch before starting the heel. And as you can see, I started with stockinette instead of ribbing so the cuff would roll. Without an 8 inch cuff (which is what I usually do), knitting these socks was incredibly quick! The yarn is KnitPicks' Hawthorne, which I'd never tried. 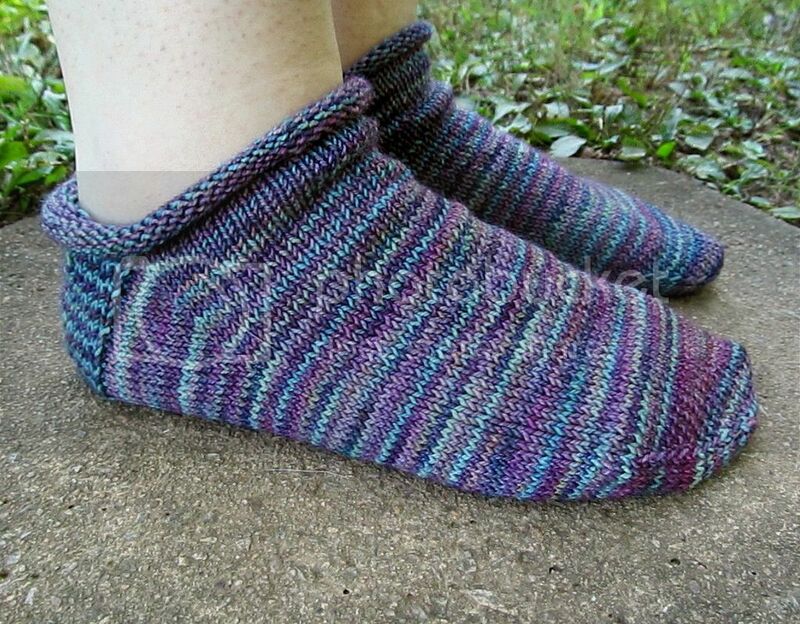 As I've mentioned before, I love the softness and strength of their Stroll sock yarn...it holds up really well. But I don't love the colors. I always end up being disappointed with how they pool, in the tonal and handpainted yarns. Hawthorne isn't quite as soft as Stroll, but it has a high twist, which I love in sock yarn. It makes it feel even more durable. 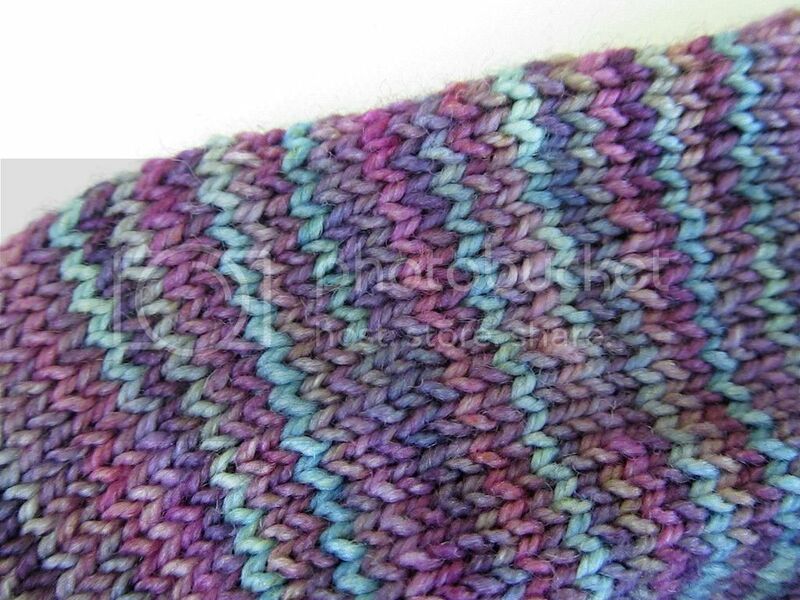 And while I was worried about how the colors might pool, they knitted up in such a pretty way! This is how I want all hand-dyed, variegated yarn to knit up. :) The colors are so much nicer than they look in the photos: rich teal blues and purples. I'm pretty happy with how these socks turned out. They feel a little big. I'm not sure if that's because of the yarn (maybe my gauge is a little different with Hawthorne) or because there's no ribbed cuff to hold them up. Maybe I should have done ribbing? Anyway, I'll know better for my next pair.